Singapore: With Donald Trump pulling the US out of the Paris climate accord, China and India will have to shoulder the burden of keeping a lid on global warming. But even if the two most-populous nations are willing to take up the mantle, their ability to pull it off is uncertain. India’s solar industry offers a case study. 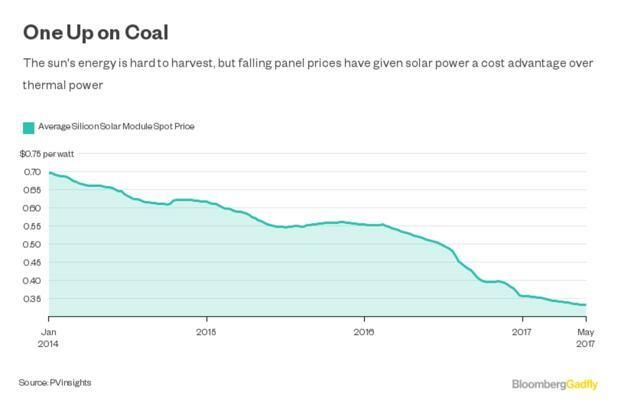 Thanks to a dramatic decline in prices of Chinese-made solar panels in the past several years, burning coal is now almost 59% more expensive than harvesting the sun’s energy. About 14 percentage points of that difference comes from the equipment required by a coal-fired power plant to reduce discharges of toxic fumes and particulates, according to calculations based on data from Bloomberg New Energy Finance. Put another way, if New Delhi were to turn a blind eye to pollution, coal would still be 45% costlier than solar. That doesn’t mean an unraveling of the Paris deal will have no effect. The most important raw material in power generation isn’t fuel: It’s capital. One of the main reasons Masayoshi Son’s SoftBank Group Corp. and Indian telecom tycoon Sunil Mittal’s Bharti Enterprises Pvt. can afford to offer solar power at Rs2.44 (3.8 cents) per kilowatt hour is because the industry is confident that refinancing, say, five-year debt would become progressively cheaper over the 25-year lifespan of a solar farm. If that assumption comes into question, it might be difficult to justify the aggressive pricing, which compares with a levelized cost of Rs3.9 a kilowatt-hour from a new coal plant. In lambasting China and India for using climate to gain an unfair advantage over the US, Trump has chosen to ignore the severity of their clampdown on coal. As much as 68 gigawatts of construction at more than 100 project sites in these two countries is now frozen, according to a March report by the Sierra Club, Greenpeace and CoalSwarm. In capital costs alone, that’s a hit of anywhere from $250 billion to $350 billion, depending on the technology. 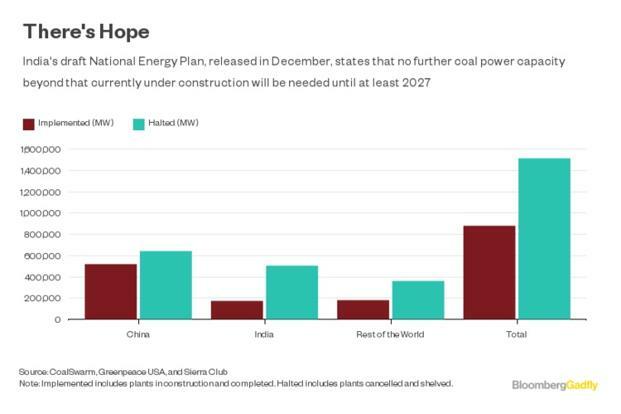 Add plans that have been cancelled, and India alone has turned its back on more than 500 gigawatts of coal. Granted, this decision isn’t entirely altruistic. The capital New Delhi, for instance, was choking on toxic fumes last winter, while last summer the country was running out of water to sustain thermal power. Whether or not we’ll always have Paris, rapid cancellation of large-scale coal-based power plants may continue. But India lacks China’s abundance of domestic capital. The government can only execute a successful divorce from coal if global financing conditions for renewables remain favourable. That’s hardly a given in a country where many distribution utilities can’t even pay producers on time. When they do pay, the take may be worth less to an overseas investor if the Indian currency depreciates. Besides, stranded coal power plants have already pushed up the bad-loan ratio at state-owned specialist lender Power Finance Corp. to 12.5%. Stranded solar is something nobody even wants to think about.